Adjacent and to the east of the market, along Yaffo Street, is a beautiful building that is currently slated to be turned into apartments or offices or something. This was once the Etz Chaim Yeshiva (a Jewish school for Torah study). As a way of raising money, in the 20s and 30s, they found donors who gave money to build shops along the eastern side of Valero’s field, and the yeshiva would then earn the rental income. These are the 40-or-so shops on Etz Chaim Street (aka “the covered shuk”), from Yaffo down to the passage into the parking lot area. I have not seen any, but I have read that behind the roofing, above the shops, there are many signs recognizing the original donors. Following the initial laws enacted by the British, and their difficulty in meeting the British requirements in the makeshift market, a group of Jewish merchants appealed to the Vaad Ha’Ir, an organization that represented Jewish interests to the British. Following a 1922 letter, the Vaad helped these merchants purchase land from the Valero family, and loaned the merchants money for construction. The group of mainly Persian Jewish immigrants from the nearby Neve Shalom neighborhood built four parallel rows of shops facing in on what are the streets of HaTapuach and HaAgas (The Apple Street and its neighbor to the south, The Pear Street). While this created a nice market with better quality, it also meant they needed to charge higher prices. They had trouble competing with the unregulated merchants still selling in the adjacent lot. This led to tensions between 1925 and 1930, with both groups appealing to the Vaad. Unfortunately, however, the Vaad no longer had money to help, and the peddlers themselves had less money than those who created Agas and Tapuach streets. Instead the Vaad helped by appealing to a bank who made 6-year loans for the purchase of the land and the construction of shops. The area at the southern end of the shuk today, bound by Etz Chaim, Agrippas, Machane Yehuda and HaShaked (the Almond) streets houses what is known as the Shuk Halva’ah V’Chisachon (The Savings and Loan Market). It includes HaEgoz (Nut), HaCharuv (Carob) and HaTut (Strawberry) streets. 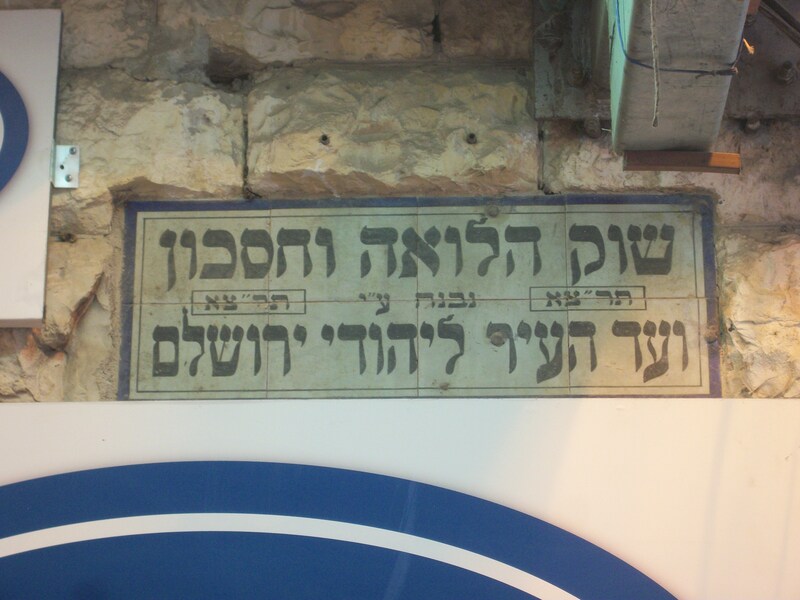 The cornerstone was laid on July 15, 1930, the construction contract was won by locals Avraham Friedman and Nisim Mizrachi, and by 1931 the market opened with 81 shops. The British enforced standardized design on these shops, and the merchants organized with a set of rules. Only Jews were allowed to own or rent there, and they formed an owners organization. 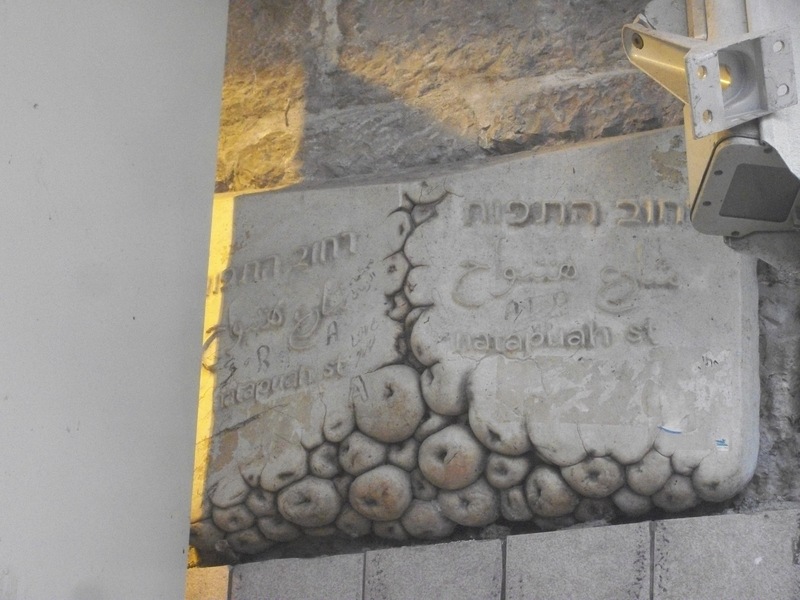 Today, there are signs with the name and founding date in Hebrew at the corner of HaShaked and Machane Yehuda and (partially broken) at the corner of Agrippas and HaEgoz. Also in 1931, another group wanted to establish a more permanent shuk. 22 sellers joined together and built Shuk Bet (Market “B”). It is located in the roughly C-shaped area to the west of Machane Yehuda Street. Later, since many of the merchants there were of Iraqi Jewish descent, the market became known as the Shuk HaIraqi. Yellow awnings mark the entrances from Machane Yehuda Street. Just south of the Etz Chaim Yeshiva was the Kiach School. One of the first modern schools in Jerusalem, it was started by French Jews. The name Kiach is an acronym for the Hebrew words Kol Yisrael Chaverim (All Israel are Friends). Taking a page from their northern neighbors’ book, they built stores as income property in the 1940s. Their shops run along the southern part of Etz Chaim Street (starting at the passage to the parking lot), turning and heading east on Agrippas. At the northern edge of the shuk, bounded roughly by Yaffo, Machane Yehuda, HaTapuach and Etz Chaim Streets, there is a central courtyard. Today it is best known for housing the Casino de Paris bar, and the backyard seating for Trattoria Haba (on Yaffo Street). But there are also many small shops there, as well as a central island of stands as well. As far as I can tell, this area was not planned as a market in the same way as some of the others. For example, the Casino de Paris bar is on the ground floor of a building that was built as a hotel and events space of the same name. (More on that in a future post.) I am not certain when the shops began opening, but certainly by the 1970s, there were a number of merchants there of Georgian origin. Georgians are known in Israel as Gruzinim, and so the market has been referred to by that name as well ever since.